What does it mean to lead with vision? In the first book devoted entirely to vision as a key leadership principle, the authors delve deeply into the notion that a compelling vision that motivates and inspires is a true differentiator for organizations that want to hire and retain talent, be more competitive, and thrive in uncertain times. But a compelling vision on its own is not enough, which is why the authors, sought-after leadership development experts globally, provide listeners with detailed analysis of the essential things leaders must do to effectively engage the workforce around that vision: embody courage, forge clarity, build connectedness, and shape culture. 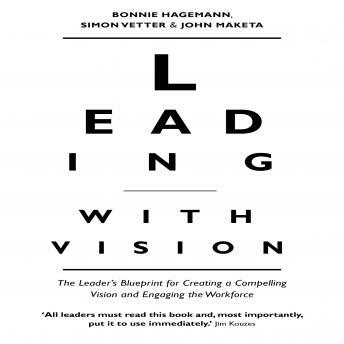 Leading with Vision draws on quantitative data from the authors' research of over 400 companies supplemented with real-world examples from thoughtful leaders who exemplify the core principles of leading with vision in established companies, including: Olukai, Bumble Bee, Coresystems, Jimbo's, Bunge, and more. The audiobook also includes an actionable blueprint developed by the authors that leaders and their organizations can implement on day one of their journey.